Innate tonadm8t, taking off the screen protector makes a huge difference in the FPS response. In the past month in had to moisturised my hands loads in fear the fsp not working. Haven’t receiced it yet..idk why…open Romania here..anyway I can trigger it manually? Have you checked in the Galaxy store…. That’s where you’ll find it. It is first time that I see this kind of update. Why it is not available as OTA ? Wow. I didn’t know that Abhijeet is Editor-in-Chief. Portugal S10+ unlocked version available this morning. The fingerprint reader is really super fast now. So far no match ! Go go Samsung! Got the update this AM in the US on S10+ AT&T variant. Rarely use fingerprint because the facial recognition sees me first – but so far seems much faster and no longer do I have to try several times to get it to work. Does it mean it’s also a way less secure? Some guy was able to easily trick the FPR even before the patch. I guess now it should be easier? I also got the update in this morning in romania. That update made the FPR perfect! The update also landed in Denmark this morning. Hvordan opdaterer du fingerskanneren? Jeg har ikke fået nogen opdatering endnu. I also got the update this morning in Switzerland. I checked for updates in the Galaxy Store and there was nothing. 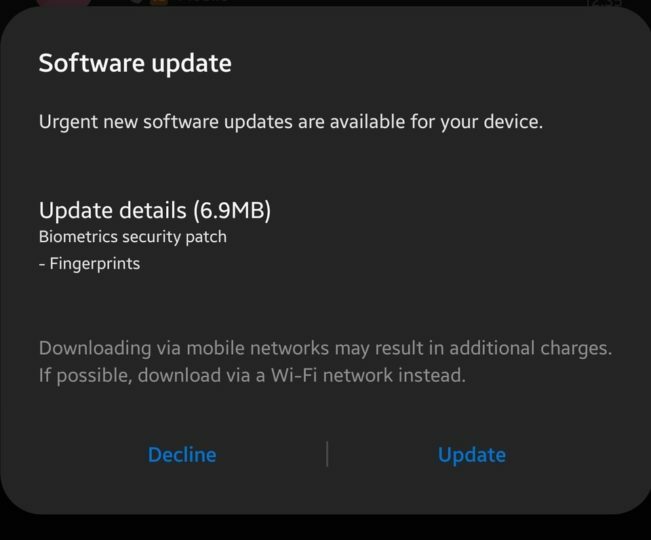 Few minutes later a notification for an update of biometrics popped up. Just received the update on my Hong Kong version the update is through the Galaxy store and it works alot better than before I must say. But the question is, do we still need to remove the included screen protector to get this type of response or if it is responsive in both scenarios? I’m using the original SP and it works great after the update. Perhaps it would be even better without the protector, but i’d rather keep my screen scratch free.